Steven Gerrard made his managerial debut as his Rangers side took on FK Shkupi in their first Europa League qualifier. Under the expectant eyes of the Rangers fans, with not an empty seat in sight, his team secured a 2-0 win to take to Macedonia, with encouraging signs – albeit fledgling – of the ‘relentless’, ‘full-throttle’ style that has been much hyped since his appointment. Evidence of exactly what this style looks like is of course limited. With the only other viewing of Gerrard’s side being a 6-0 rout of League Two Bury, many questions are yet to be asked of Rangers in this latest chapter, let alone answered. General themes and strategies are, however, already visible. It seems as though Gerrard will stick with the 4-3-3 he favoured with Liverpool’s Youth League team, with some notable quirks. There is a strong emphasis on overloading the centre, with Jamie Murphy moving heavily into the middle from the left side. Alfredo Morelos looks like he will continue in his role as a combinative striker, moving freely laterally to create small overloads in the last line before arriving at the back area for crosses. Indeed, combination play seems heavily emphasised in advanced areas. Scott Arfield takes a central position when Murphy moves inside, not dissimilar to the tip of a diamond. This gives him access to either halfspace as well as strong connections to the players in these positions for quick-fire passes to break through opposition defences. This is especially visible on the right side, where the selection of last season’s star winger Daniel Candeias as the right eight alongside forward Josh Windass and dynamic right back Jason Tavernier gives the Gers multiple threats to the opposing back line. 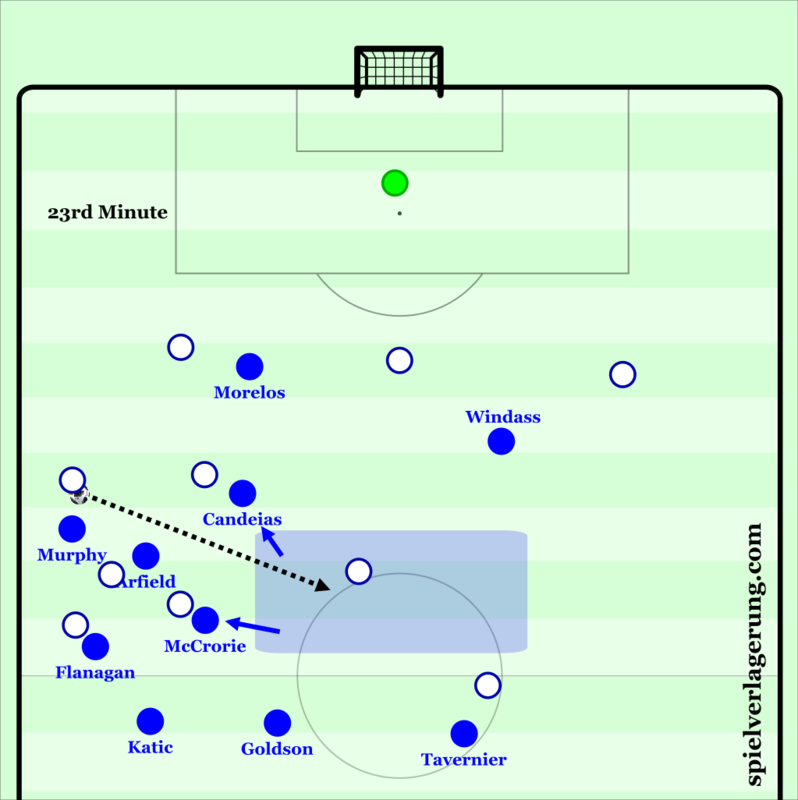 This wing play forms an integral part of Rangers’ attacking strategy, as they seek out crosses from good locations, even if their occupation of the box has room for improvement. Much of the excitement around Gerrard’s appointment and the early days of his reign was associated with expectations for his approach without the ball. With his background and talk from their pre-season camp suggesting a high-intensity attack pressing defensive system, there are certainly signs that this is well on its way towards being a staple of Rangers’ game under Gerrard. Pressing high with a 4-1-2-3 gives them access to the opposition’s back line, forcing a fast progression. Thereafter, physical ability, man-orientations, and intense pressure will see them win possession from most opponents fairly simply. A decently compact 4-3-2-1 in deeper midfield pressing aims to block the centre somewhat without ceding the flanks, with the ball-near eight pressing outwards diagonally in the halfspaces. Initial impressions did little to suggest that Shkupi were going to cause the hosts much problems. 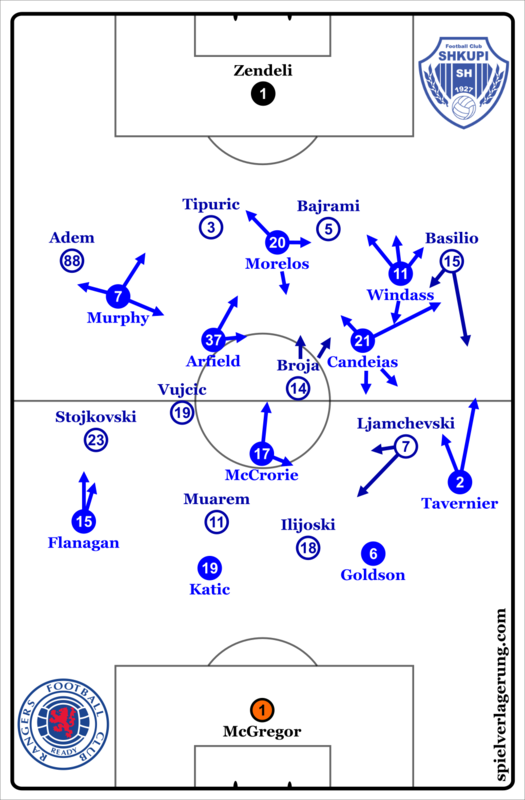 The forwards in the Macedonians’ 4-4-2 against the ball were disconnected from their midfield teammates, pinned back by the advanced positioning of Arfield and Candeias. 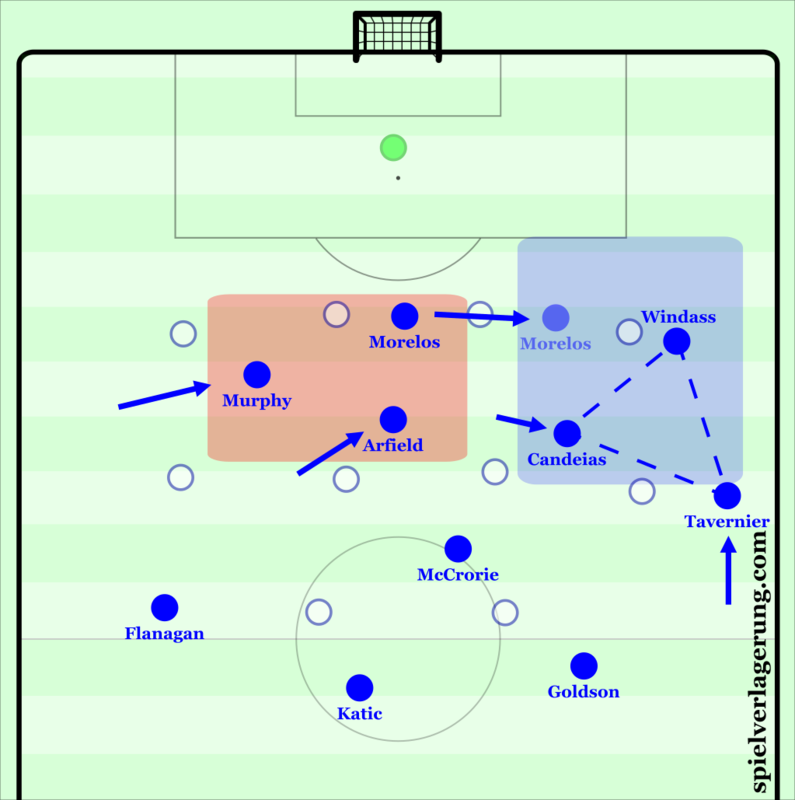 Rangers, thus, enjoyed a rarely impeded build-up, with the large spaces around McCrorie easily accessible either via the fullbacks or through blindside movement from the Rangers youngster. Rangers, however, struggled to capitalise on these advantages. Coordination issues and poor individual decision making in advanced zones saw the home side unable to break through with combinations in the centre. Jamie Murphy’s movements inside, particularly in their timing and the consequences on spacing for his teammates, produced precious little against a team whose defensive set up was clearly exploitable in the halfspaces. On the right side, Candeias’ tendencies to drift towards the right flank took him away from Arfield in the centre, reducing options for fast combinations there. The build-up play, while untroubled, suffered similar problems. McCrorie, through his movements away from the ball, pinned the Shkupi front line, at the expense of moving towards the second striker, and often into the cover shadow of the first. While it restricted his ability to get the ball, it served to prevent the forwards from pressing outside the centre, giving the back line time and opening up spaces in front of them. Arfield has very little means to keep possession here. The use of these spaces, however, was suboptimal. Goldson and Flanagan, in particular, chose odd moments to play forwards, often refusing to commit opponents with provoking dribbles to give advanced teammates more space, or outright giving the ball to players with poor orientation, surrounded by opponents, and with no route to play away. There is plenty potential for Rangers to develop their use of circulation to improve the condition for their combination play in more advanced zones, though they are lacking the types of midfield structure at the moment to focus on a stable, linear, wing combination game. What Rangers have instead is wide triangles. Candeias, Windass, and Tavernier act fluidly as a trio on the right flank, balancing each other’s movements and accelerating play on their side with their combinations. Windass is the most direct and forward-pushing of the three, often finding himself on the last line, and most likely to be on the end of crosses. These diagonal movements towards goal are offset by Candeais moving to the flank – a move which saw the winger find plenty of space out wide as the left back moved with Windass. Tavernier acted most often at the base of the triangle, but was useful at times giving depth on the flank, and could be strong moving infield to the right halfspace. Windass and Candeias used their wide rotations well to establish Rangers in the Shkupi half. Already holding a central overload, and thus dissuading the Shkupi central midfielders from covering too far wide, one of the wide players would drop into the right half space, with the other offering wide – pinning the left midfielder. Due to the opposing front line being so disconnected and not offering substantial backwards pressing, these spaces were open for Rangers to bring the ball forwards in. On the other hand, the left side lacked such fluency. 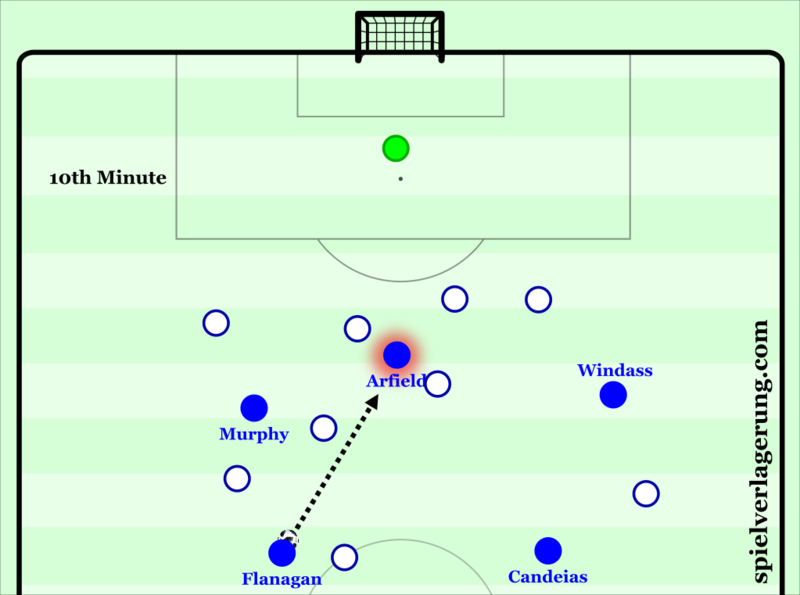 Murphy, Arfield, and Flanagan were rarely coordinated in their movements, and as such offered little in the way of combination play. Instead the left flank was most productive when Murphy looked to dribble the right back, with his two teammates keeping their distance. Rangers’ high pressing largely prevented Shkupi from establishing control on the game. The wingers split the fullbacks and central defenders, with Murphy starting closer to his centre back while Windass would run from the left back to left centre back, keeping the wide man in his cover shadow. Though this left the left back free, finding him was only possible through difficult chipped passes in tight spaces. In the centre they adopted a man-marking scheme. Arfield and Candeias largely looked after the two central midfielders, though the latter often moved wider to gain access to the left back. Morelos took a somewhat passive role in pressing, looking to block passes to the near central midfielder rather than aggressively press the ball-carrier. This was the case despite this player almost always being marked already, and therefore not really a threat to receive the ball. Whereas the high pressing was generally successful, in deeper zones there were glaring issues. As the wingers fell deeper and the hosts approached a 4-1-4-1 or 4-3-2-1 defensive structure, the man-marking that brought Rangers so much control high up the pitch opened up large gaps in their midfield. Arfield and Candeias pressing forwards next to Morelos left huge spaces either side of McCrorie which were found by the visitors, if not massively punished. The Shkupi attack from which Rangers countered for the opening goal. Candeias’ involvement in pressing as the far central midfielder leaves McCrorie with a huge amount of ground to cover and multiple options. Man-marking here removes his ability to hedge, leaving the centre open. Furthermore, the drop off in intensity as the second half progressed was hugely detrimental to their pressing. At a time when Rangers were looking for a second goal to kill off the match, they were unable to gain the same level of control as they enjoyed in the first half due to the time and space Shkupi had on the ball. While such a drop may be dramatic, it is perhaps to be expected due to the stage of the season they are at. There are plenty of positives for Steven Gerrard to take away from his first competitive senior game in management. A 2-0 lead to take into the away leg is almost surely enough to see Rangers into the next qualifying round, while the match fitness and group-tactical fluency gained will stand his players in good stead for the coming weeks. It’s The Sevco Rangers and The International Basket of Assets 2012 that now perform a circus act on a weekly basis in the SPFL and for a two week run in Europe during the Summer time. ‘Chucky Orr’ – wow, that’s really poor trolling. Quite pathetic really. Even more pathetic given that you are posting on a tactical analysis of Rangers.